Cloud computing is a significant trend with the potential to increase agility and lower costs. One key challenge for IT executives is developing an enterprise-wide strategy for cloud computing that’s proactive and drives the business. In this session we will share how Intel IT is developing a cloud computing strategy based on growing the cloud from the inside out. This will include plans to grow Intel IT’s internal virtualized computing environment to support an increasing number of cloud-like attributes over time and the immediate plans to aggressively expand and evolve this internal environment. Brian McGeough is part of Intel’s IT Engineering organization and is responsible for Intel’s internal data centre manageability strategy. 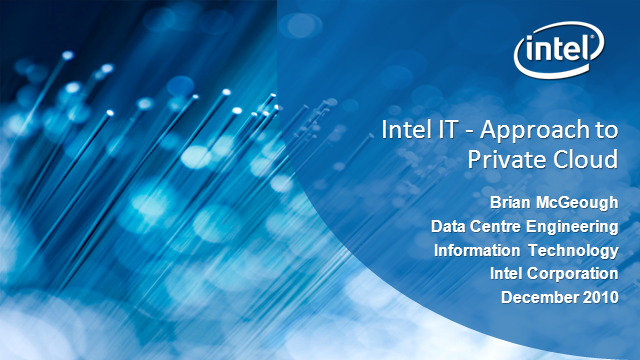 In this session, Brian will detail his experiences with private cloud deployment to date, what is planned, and share how Intel IT is developing a cloud computing strategy based on growing the cloud from the inside out.